I found the history on my 1967 Beetle! I spoke to the family that owned it from new and who restored it in 2002. It was bought new from the VW Dealer in Weston Super Mare, England, in February of 1968. It had been built May of ‘67. The couple bought it because the husband had a 2-seater Morgan. Since they had a daughter on the way, they needed a “family” car. The Beetle was owned by the same family until 2015! A private plate was put on the car in 1977, which was taken off in ’84, when it lost its original *Registration Number (License Plate Number), which I know, and went onto the Registration Number it has now. Then, in 1984, the Beetle was parked and stored until 1991, when the daughter took it to Edinburgh University. She rarely drove it when she was at University, so it was garage-stored until early 2002 when she lost the storage. At that point, the car was brought to Torquay, where her Mum and stepdad lived. The stepdad carried out a restoration on the car—well, when I say “resto”, it had a strip-down and repaint, then a full rebuild, since it didn’t need any welding! He replaced the engine with a Remtec exchange unit because the oil had turned to sludge in the original engine due to lack of care and he was worried what that had done to the bearings. It then sat again from ’05, when he finished the work on it, until 2015, when they auctioned it at the classic car show in Shepton Mallet. 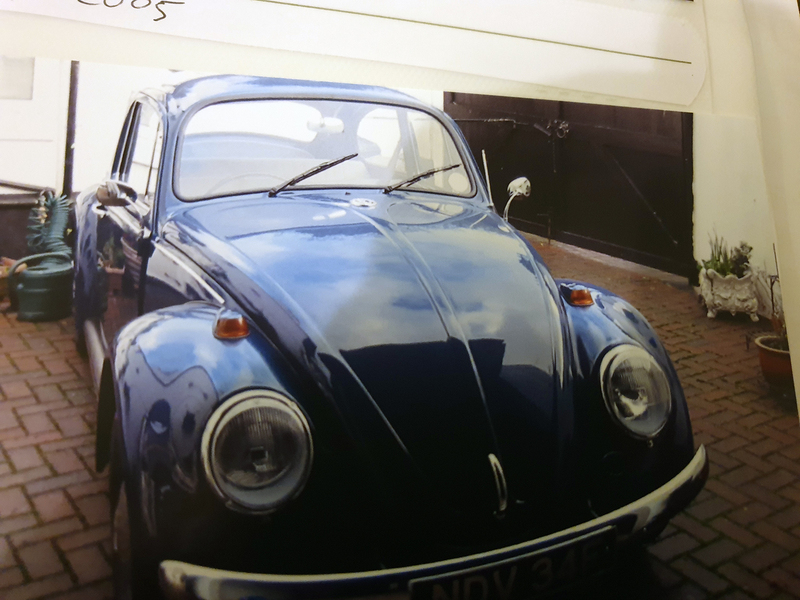 The Beetle was bought by Ian Studley of Ian Studley Cars, a classic car dealer. He had it for 3 years, and “deluxed” it. **The car originally was a 1200 Model. It originally had (and still has) a 1200cc engine. The engine was swapped with the same size, just a new exchange Remtec 1200 unit. The car is what was called a Sparkafer Model (you didn’t get these in the USA). There should be two dots above the last ‘a’ in Sparkafer. The Sparkafer was the Economy Model, a lower spec, non-Deluxe Model. It was a lot rarer than the 1300 or 1500 Models, whilst still having the European ’67-only parts. 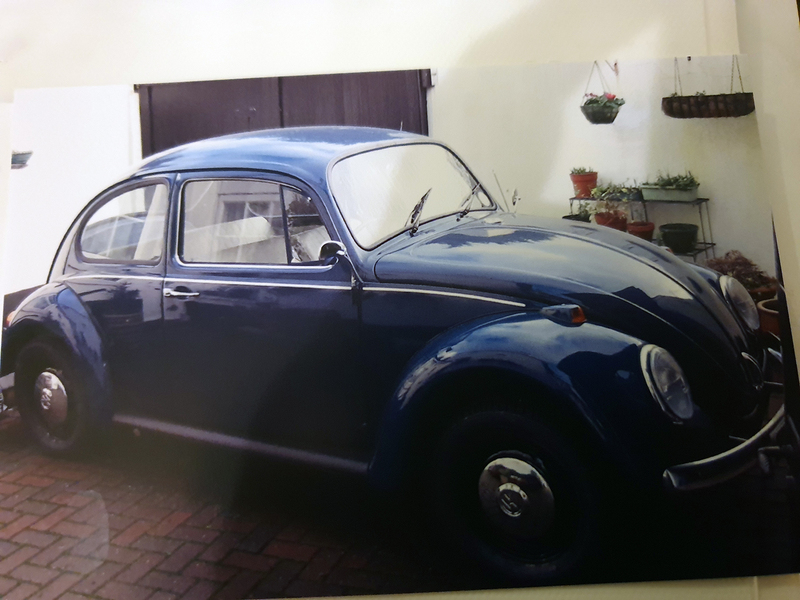 Originally (different from the 1300 or 1500 models) my Beetle had no bonnet (hood) or window chrome trims, only one horn grille and no interior chrome dashboard trims. It had blade bumpers with no over riders, only a partial headliner, and body-coloured front quarter window vents as well as black wiper arms, and drum brakes on the front–not discs. The last owner “deluxed” the Beetle, adding most of the Deluxe Model trim, but kept the partial headliner. It still has drum brakes and still has the body-coloured front quarter window vents. Mainly, he added the shiny chrome bits. I would put it back to stock, but I can’t, since they drilled the bonnet (hood) for the chrome trim, unfortunately. In 2018, Mr. Studley px’d it (did a trade) with another classic car dealer for a Jaguar XK120. That’s when I bought it. From ‘02 until I bought it, it had been driven only 299 miles in 16 years! The engine isn’t even run-in yet! I’m only the 3rd owner from new, and it’s a genuine, unwelded UK car, with all original panels and a genuine 52k miles from new. Unfortunately, the original paperwork was lost in Edinburgh, along with the original keys! The original owner obviously can’t prove it, but since he had the car for 47years, I’m happy to take his word on it. I have all the photographs of the work he did on it too. I’ve since sorted a few minor issues and added rear mud flaps, inertia reel rear seat belts, because I have 2 small children, and a roof rack. I worried that I’d overpaid for the car, but knowing all this now, I think it was cheap! Editor’s Notes: *Reg nr = Registration Number. In the UK, the Registration Number stays with the car throughout its life, unless the owner purchases a Private Registration Number and puts it on the car. **The 1967 Beetle could be purchased in several versions destined for other countries. Luke’s Beetle was delivered as a 1200, with a 40 Hp Engine and other variant features. The afore-mentioned dealer “deluxed” the car, meaning that he attempted to bring it to the Deluxe Model standards. Luke lives in Wiltshire, England—a rather large County. Among other landmarks, Wiltshire is known for the Stonehenge and Avebury Circles. The city of Salisbury (in Wiltshire County) is notable for its Mediaeval Cathedral. Luke has no lack of places for wonderful photo-shoots of him and his ’67 Beetle. 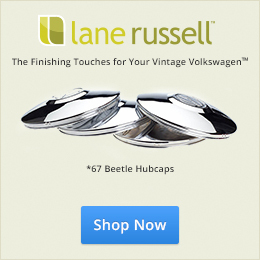 Luke, thank you for sharing Your Story with the 1967Beetle.com Community! Great story. Always nice to know the history of a car. You can imagine memories past. Also a rare find in it’s Sparkäfer guise. ( I found the two dots above the a ) Enjoy the car . Another solid tale of a classic car. Well done, Mr Salser. Hi, Clyde–It is good to hear from you. Luke wrote his Story–I only edited it. Luke and I messaged back and forth and decided that more of the story needed to be told. I credit the Owners of cars in these Articles for 1967beetle.com with doing their homework to learn the history of their Beetles. When histories are known, it gives all of us a better understanding of how The Volkswagen evolved! Thanks, Jay. What does a partial headliner look like? I’m embarrassed to admit the cattle hardly know it. I’ve gone out visiting neighbors a bit but not after dark, heyhey. Dawn’s brother and his wife were here in the summer. We decided to take a drive, then went on down to some mutual friends. It got dark as we visited and we had to drive 5 miles home by moonlight because the headlights didn’t work. Didn’t see another car. It’s pretty quiet around here, even with that after market exhaust. Anyway. Harvest was a struggle, with breakdowns and rain. Whatever spare time we had was spent fixing. The headlights still don’t work and soon we’ll have salt so the bug will stay home. The car is a peach and its very rare to find a genuine UK car thats never been welded, its usually only imported cars that are this solid, made even rarer in that its a 67 Sparkafer. The headliner does indeed stop before the windscreen, its basically just inside the central bit of the roof, leaving the rest exposed painted metal. The only sheet metal part that has been replaced is the rear bumper as the original owner told me it was cheaper to buy a new one rather than re-chrome it.